Women’s Rights National Historical Park opened a new exhibit It’s Alive! It’s ALIVE! 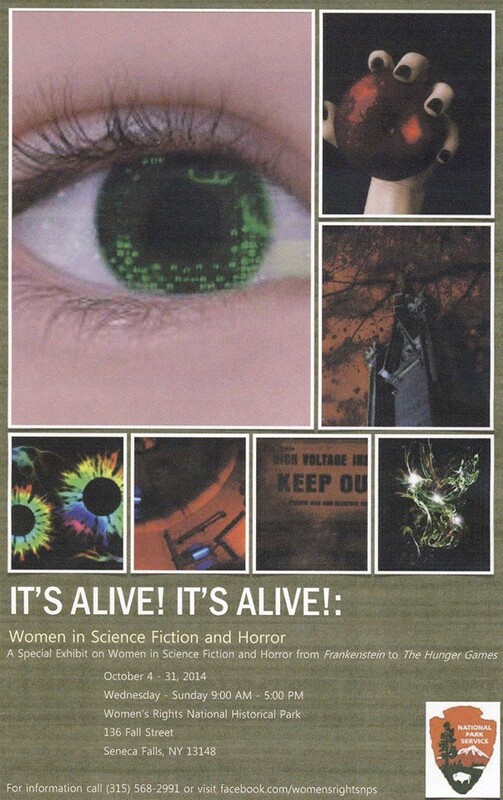 Women in the Genre of Science Fiction and Horror October 4 in Seneca Falls, New York. The site is associated with the beginning of the women’s rights movement in the United States. The town held the First Women’s Rights Convention in 1848. The park preserves Elizabth Cady Stanton’s home and several other buildings in Seneca Falls and nearby Waterloo. The exhibit highlights the contributions of Mary Shelley, Anne Rice, Shirley Jackson, Susan Collins, and others to the sf and horror genre. The exhibit is the brain child of Ethan Lewis, a graduate student at Syracuse University interning at the park through the generosity of Eastern National, a cooperating partner of Women’s Rights National Historical Park. Lewis will be giving uncanny and haunting tours of the exhibit as Dr. Victor Frankenstein on Fridays and Saturdays throughout October and dares you to join him. The exhibit runs til October 31, and may be expanded in the future to include characters in TV and film.